Description: This device can be used as a light intensity meter. You can use this to compare the intensity of two light sources and view how light intensity depends on distance. Clamp a light to the end of a table. Connect the light bulb to the VariAC. If a new phtometer must be made, take two bars of paraffin was, place a piece of aluminum foil in between them and tie together with rubber bands. 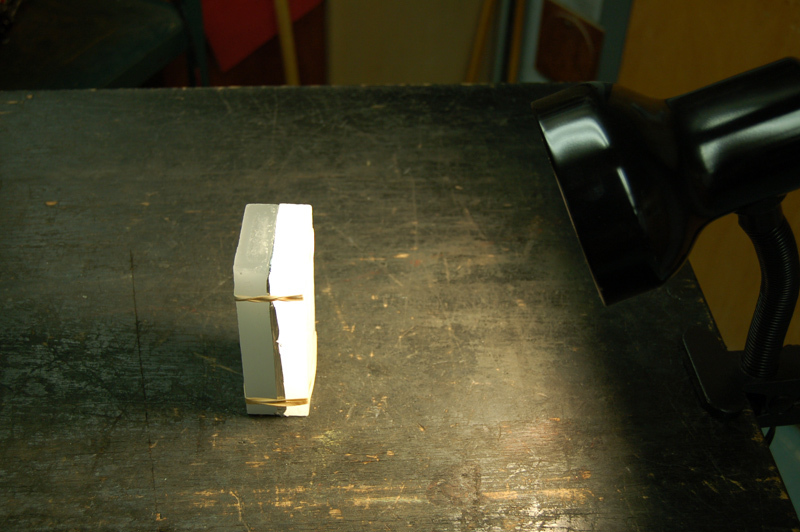 By holding the photometer so that each wax block is facing a light source, you can compare the intensity of the light from two sources. You may also vary the distance between sources and show that the intensity follows the inverse square law (use one light as a reference source). When finished, turn off both lights. Note: Don't place the Paraffin block photometer near any hot light sources, as the wax may melt.